This finely woven textile combines cotton and camelid fibers, both of which have a long history in Andean weaving. In Peru, where this cloth was made and used, colonial textiles often combined weaving traditions and designs of local origin with those imported from Europe and Asia. Compared to other Peruvian weavings of the time, this one is relatively small, measuring 124.5 x 42.5 cm (49 x 16 ¾ inches). A horizontal band forms the central axis of the cover, with repeating, but not identical patterns in the panels above and below. The panels contain a multitude of animals: birds, monkeys, fish, deer and foxes. The animals seem to float against the brightly colored background and do not form a unified narrative scene. Along the edge of the textile, the scalloped design may have been inspired by bobbin lace, a much admired luxury import from Europe. The complementary colors of blue juxtaposed with deep red are integral to the design. The red was obtained from the dye cochineal, coveted not only in Spanish America but also in Europe and Asia at the time. The pattern of holes at top and bottom of the textile suggests the cover may have been folded and lashed to cover a piece of furniture. In Peru, Andean women wove clothing for themselves and their families, but they also created cloth for civic ceremonies, public festivals and churches. This cover, which has tiny holes at its edges (where it was once stitched or lashed to another object), may have adorned the back of a chair in a church. Neither the name of that church, nor the weaver is known today. This is a particularly fine example of colonial Andean weaving. The materials—cotton and camelid threads— are relatively common but the high thread count and expense of the colored dyes suggest this was a special project. Today this textile is in the Museo Inka, in Cuzco, Peru, along with a number of extraordinary textiles, paintings and other objects from viceregal Cuzco and the surrounding region. There existed in the Andes a long tradition of weaving for religious and political purposes. 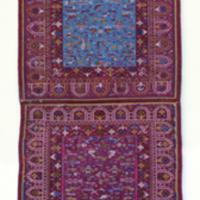 The design and fine weaving of this textile reveals the expert eye and accomplished hands of an experienced weaver. Textiles such as this one thus suggest both the creativity of indigenous weavers and the range of their products. Their designs might draw from European tapestries, lace, and earlier Andean garments, and their weavings might serve the needs of the church, draped over furniture, or be used to clothe the statue of a saint or an Andean bride. As a weaving used in a church, this cover reveals how fine hand-work, not only ritual and prayer, bound the everyday labor of individuals to places of worship. Phipps, Elena. 2004. “Small Cover.” In The Colonial Andes: Tapestries and Silverwork, 1530-1830. Elena Phipps, Johanna Hecht and Cristina Esteras Martín, eds. New York: Metropolitan Museum of Art, 335-337.